This letter was written by Rev. John B. Gould (1824-1908), the son of Rev. Robert Gould (1794-1864) and Rebecca L. Binney (1796-1858). 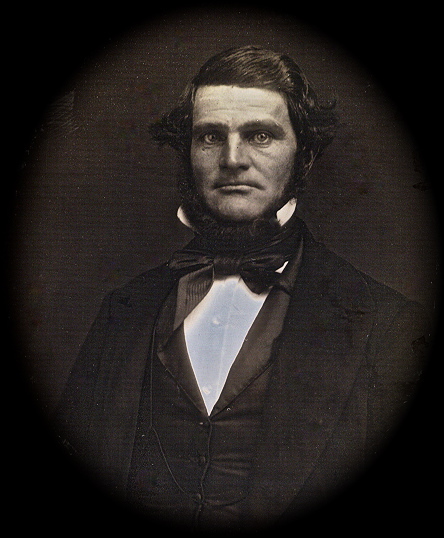 John graduated from Methodist-affiliated Wesleyan University in Middletown, Connecticut in 1846. His brother Thomas Lincoln Gould also attended Wesleyan University (Class of 1850) but died in the fall of 1847 while in college. John Gould was married to Caroline Elizabeth Denison (1825-18xx) of Mystic, Connecticut, in April 1847. He served a number of Methodist churches in New England, including Marlboro (CT); Marshfield (MA); Quincy (MA); East Weymouth (MA); Edgartown (MA); New Bedford (MA); New London (CT); Norwich (CT); Fall River (MA); Chestnut Street in Providence (RI); and Bangor (ME). Rev. Gould wrote this letter while serving as chaplain of the 11th Rhode Island Infantry during the Civil War. 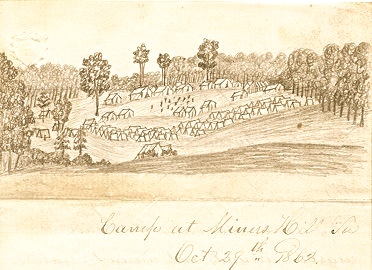 At the time, the 11th Rhode Island was encamped near Minors Hill, southwest of Washington D. C.
We are having a severe & long continued rain storm & as I can do little else I propose to spend the hours writing to friends I have left behind. I have thought of you often & intended to write, but have found the hours to pass so swiftly that I have written to but few except my own family. We are still upon the hill top & I fear shall be compelled to remain till spring. We are on the outposts in this direction about three miles from Lionsville. 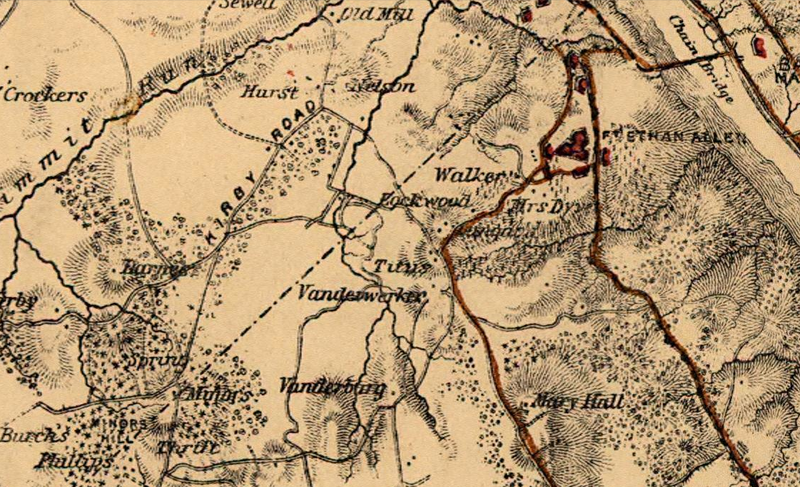 The enemy are not at present near us, but fearing one of Jackson’s raids it is considered necessary to keep this road to Washington well guarded. Minors Hill lower left; Chain Bridge over Potomas upper right. Two days ago, we were ordered to have three days rations cooked. Had shelter tents given out & were ready to move at a moment’s warning. The boys seemed pleased at the prospect of a change, but it has rained ever since & “all is quiet along the Potomac.” We may move any day, our position depending upon the movements of the general army. I fear that this rain may impede Burnside in his progress. It would be sad indeed if the rainy season should come on & the mud caused all operations to cease. Burnside’s appointment is popular with us as hosts of the soldiers are very impatient at their long delays. The rebels are always ready but we must make long tarry to get ready for a battle. All these delays only give the enemy a chance to learn our plans & bring their forces together to checkmate us. We have been very anxious to join the expedition under Banks which we suppose is going to Charleston. I should like much to be be in at the death of that city. We have a fine regiment & our general says many very flattering things to us. I know that few chaplains have so easy an opportunity to carry out their plans as I do. However it is not home & I would not remain here a day as a place for pleasure. It is not to be compared with the pleasure to be derived for the pastorate of a N. E. church. It is an important position for someone to fill & I do not regret the step I took in coming. We have social meetings three times a week & find many excellent men ready to sustain them. I hope you prosper in Chestnut Street. Let me hear from you as to movements at home. This entry was posted on Wednesday, May 28th, 2014 at 3:16 pm	and posted in Uncategorized. You can follow any responses to this entry through the RSS 2.0 feed.